May the fourth be with you folks! I’m sure you’re all thinking it’s actually “May the force be with you” right? In case you didn’t know May 4th is Star Wars day and Star Wars super fans like myself say, “May the fourth be with you” on this special day. I like to throw a little Star Wars movie marathon party on this day and I cook up some special Star Wars themed treats for the occasion. I have been obsessed with BB-8, since I first laid eyes on him years ago. I’m so happy to incorporate him into this years party with these DIY Star Wars BB-8 Cupcakes! Hi everyone! 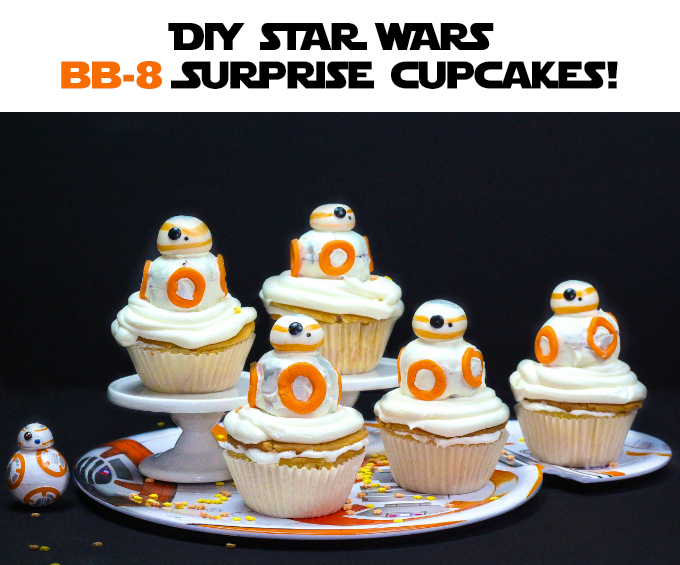 I’m Vanessa Diaz of Brite & Bubbly and here’s how to make these tasty and super cute BB-8 Cupcakes! First you melt your white chocolate candy melts in your microwave for about a minute and a half. You then use your small skewers to dunk your donut holes into the chocolate. This will create the circular bottom of BB-8. While those are starting to dry, quickly roll out you orange fondant and cut circle pieces out with your small 1-inch cookie cutter. You then take your coupler piece and cut out the centers of your round 1-inch orange fondant circles. Try to keep your fondant in plastic wrap or in a plastic sandwich bag when you’re rolling to keep it soft. I forgot to do this and mine began to harden quickly. Before the chocolate hardens, stick these little orange fondant circles to each side of your white chocolate covered donut holes. You then bake up come cupcakes in your cupcake pan using the directions and ingredients on your cake mix. You then cut the tops off your cupcake and cut the center out of your cupcake. You can also use a specialty surprise cupcake pan, which is what I did which essentially does this for you. Fill your cupcake holes with your Star Wars themed candies and sprinkles. Ice the edges and place the cupcake tops back on to secure the surprise inside. I have to take a minute say how obsessed I am with these R2-D2 sprinkles! Aren’t they amazing! Roll your white fondant into balls and cut in half to make BB-8’s head. Attach a round black sprinkle to the BB-8 head with black or white icing. Spray some of your silver and orange color food mist into your bowls. Decorate your BB-8 heads by using your pointed brush and silver and orange color food mist to brush on silver and orange accents around his head. Roll a little piece of black fondant for the smaller eye and attached to the head with icing and your skewers. Stick the heads on to the donut hole bottoms with the left over white melted chocolate. Ice your cupcakes and place your BB-8’s on top of your cupcakes. The force is strong with these cupcakes! That’s how you make them! Super simple and the perfect Star Wars Day party treat. They would look perfect on a BB-8 serving tray. I think they came out great for my first time making them! They can be served on a tray or on mini cake stands. When you bite them open a surprise of candle and sprinkles rushes out of the cupcake. It’s fun with every bite! I hope you enjoy these cupcakes as much as I do on this very special May the 4th! Happy Star Wars Day everyone! Be sure to shop the baking section of your favorite JOANN Fabric and Craft Store to make your own little BB-8 Cupcakes for May the 4th!